Below is a list of the equipment and necessary work area requirements for candidates completing the TypeWell Basic Skills Course. The transcriber candidate should wear good quality headphones to hear the lectures in the transcribing lessons. Alternatively, external computer speakers can be used but are not recommended. There are lessons that require the student to print multiple pages. The candidate can save the file to a device such as a USB key drive and print it on a different computer than the one used for the course. The transcribing candidate needs regular access to email and the Internet on a computer, but it need not be on the same computer that is used for the course. Some lessons require the candidate to copy a special file from the course program and upload it to the Internet account page. Thus, the course computer must be able to accept files from a PC writeable device such as a USB flash drive. Directions are included in the course software. We suggest that the candidate only use one email account to receive messages from TypeWell, and we strongly recommend that he or she check regularly for messages. The candidate will sign in to the course account on any Internet-connected computer to submit each assignment and receive the password for the next lesson. The transcribing candidate needs a phone for direct contact with the TypeWell teaching team. Find a quiet room with a door that can be closed to facilitate concentration and minimize distractions or interruptions. Use a small, portable work table that is designed for stenographers (see below for recommendation). Adjust the height so that the hands and wrists are slightly lower than the elbows when typing on the keyboard. This promotes good blood flow. Alternatively, the transcribing candidate may use an adjustable table. However, be sure it prevents the wrists from resting on the edge of the table and keeps the wrists slightly lower than the elbows. To avoid fatigue and discomfort, the candidate should keep feet flat on the floor. If desired, place a side table nearby to refer to the course handbook or to make notes. Get a comfortable, padded chair (add a lumbar pillow for support) that is compatible with the work table. Do not use a chair with arms that may impede or bump upper body extremities. The student should monitor the time and limit work sessions to an hour or less. The sponsor may provide this equipment. Whatever the circumstances, we strongly recommend that the candidate use a portable steno table during the Basic Skills Course and when working in the classroom as a transcriber. 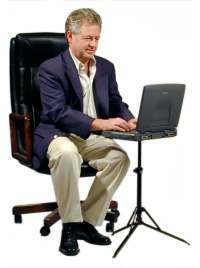 Look for the “sitting” model (CR1 or, if the candidate is tall, CR3) from insTand, sold on instand.com or Amazon. Because an external mouse is not allowed during the training and is not recommended for classroom use, we do not recommend purchasing the "mouser tray" or the "swing-out" mouse shelf. These accessories are not necessary for the work of a classroom transcriber; they will just add extra bulk and may not fit in the transcriber's roller bag. To safely transport the computer and to minimize muscle strain, we recommend purchasing a padded roller bag, available at many office supply stores.